Omnitheo wrote: "Clapping seals are a dime a dozen in politics. 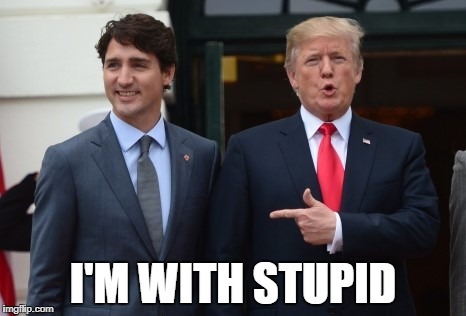 We need to replace Fuhr with someone who can think for themselves and do what's right for people here, not what's best for Trudeau and his global elite billionaire buds." now THAT was a great BURN. anyone call the fire department yet? I don't think Fuhr got the memo from Justin. Has anybody looked at how sharp-tongued and hostile he is on social media? And God forbid anyone ask him a question, as he will just block and delete you from his page. It seems that Fuhr will only deal with his Liberal cheerleaders. From what I've seen, he dismisses anyone not in his camp instantly and with hostility, contrary to what Hair and Socks is "promising" to the public. Pete Podoski wrote: I don't think Fuhr got the memo from Justin. could be worse. like fuel the economy/budget narrative endlessly. and nijabs. and putin. then to top it all of media only gets 5 vetted questions. What's Fuhr going to do? Zip his lip and cower under Trudeau's hand as the SNC corruption scandal explodes in the PMO, or take an ethical stand against criminal influence peddling of any type, including within his own party? I know what I'd bet my money on, as the trained seals clap from the backbenches for Hair'n'Sox. Gone_Fishin wrote: What's Fuhr going to do? Zip his lip and cower under Trudeau's hand as the SNC corruption scandal explodes in the PMO, or take an ethical stand against criminal influence peddling of any type, including within his own party? I know what I'd bet my money on, as the trained seals clap from the backbenches for Hair'n'Sox. no one would have any reason to call another person a racist - if they were not acting like one. people need to put on their big boy pants and just own it. loud and proud - im a racist! instead they post memes on facebook about being a persecuted caucasian or some nonsense. i guess its easier to pull the reverse victim card. no one would have any reason to call another person a racist - if they were not acting like one. Like when Turdo called that old woman "intolerant" when she asked " Where is the 196 MILLION Quebec payed for your illegal immigrants " ??? It was a simple question. " Where's the money" ? What did she get ??? Why isn't Fuhr speaking to his constituents about the SNC scandal? Why isn't he taking a leadership role and pledging to bring the truth to people who are rightly concerned that justice has been corrupted by the PM's office? How much more useless can this guy be? Gone_Fishin wrote: Why isn't Fuhr speaking to his constituents about the SNC scandal? Why isn't he taking a leadership role and pledging to bring the truth to people who are rightly concerned that justice has been corrupted by the PM's office? How much more useless can this guy be? because there are legal proceedings and he cant speak about it???? just stick with the other guys around town that wear your colors. im sure that they are exercising their vocal cords and tongues talking about nothing else ad nauseum. Fuhr could take a page from Jody Wilson-Raybould's book and do the honourable thing and resign from Trudeau's corruption-infested mess. But that's not going to happen. What a bum. ………. "honourable"……...not in "I'm a pilot(s)" vocabulary. He will NEVER do or say ANYTHING that could in any way, shape or form jeopardize a possible SIX FIGURE PENSION for life if he can win a second term of not representing his constituents...……...pathetic! Removed, there is a whole other thread for Raybould. Last edited by TreeGuy on Feb 13th, 2019, 6:53 am, edited 1 time in total. There's Fuhr voting against allowing Jody Wilson-Raybould to speak about the SNC Lavalin scandal, and against sticking to his campaign promise of being open and accountable. Disgusting.